A readable, accessible version of the ancient classic primer on the practice of yoga--interpreted by a contemporary Tantric yoga master. The Yoga Sutras is Patanjali’s classic text on how to experience oneness (samadhi) within yoga practice. Serious yoga students want to bring the wisdom of the Sutras to their practice but often find the text impenetrable and difficult to relate to. 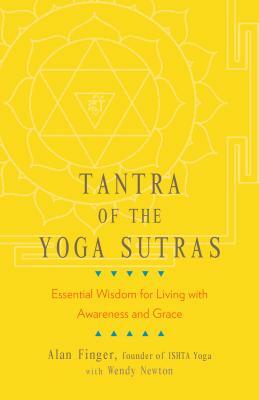 Here, yogi and Tantric master Alan Finger offers an interpretation of the Sutras that is clear and immediately relevant—and he shows contemporary practitioners that samadhi is something that they can experience here and now. Yoga is a process of spiritual evolution, and samadhi is as natural as breathing and available to all, because it is our true nature. Viewed through a Tantric framework, Finger shows us how the Sutras describe the yogic process that both leads us to the experience of samadhi and allows us to weave the wisdom and grace of that experience back into our everyday life. Alan Finger was born and raised in South Africa and was a student of Paramahansa Yogananda, Krishnamacharya, and B. K. S. Iyengar, among others. He is the founder of ISHTA Yoga, a style of yoga that blends the ancient and contemporary sciences of Hatha, Tantra, and Ayurveda into a complete and comprehensive system of self-development. He travels and teaches all over the United States, Canada, Europe, and South Africa. Wendy Newton is a senior teacher at ISHTA Yoga and a lead trainer in the ISHTA teacher training program. She has studied with Kavi Yogiraj Alan Finger since 2002. Newton’s teaching practice combines Polarity and ISHTA Marma energy work, yoga-based counseling, and ISHTA yoga asana, pranayama, and kriya techniques.